A year ago, Tahir Elçi, human rights lawyer and founder of Amnesty International Turkey, , was shot dead at the end of a press conference. He was asking for peace at the press conference. Türkan Elçi, his wife, talks here about what happened that day and the effects on her and peace in south-east Turkey. That afternoon, a year ago, my phone started ringing and didn’t stop. Something had happened at the press conference where Tahir was speaking. A shooting. What had happened? Was anyone hurt? Was Tahir OK? None of the people I spoke to told me everything they knew. They didn’t want to tell me. I ran to my car and drove quickly. Why were the other cars going so slowly? I had to stop at the traffic lights. Why were they always red? Why did they take so long to go green? As I got nearer to the hospital, I heard someone screaming. Then I understood that it was me screaming. I never knew that sometimes people don’t know the sound of their own voice. I stopped and ran through the hospital doors. One of my brothers waiting for me. 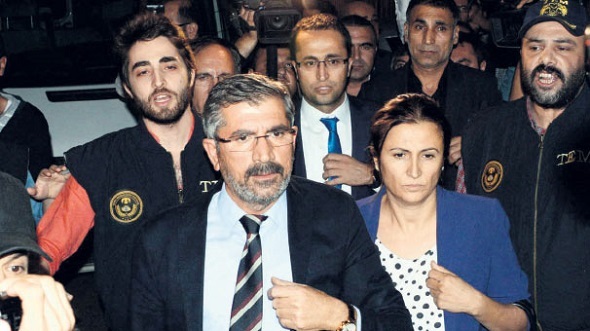 ‘Where is Tahir Elçi?’ he asked. ‘Tahir Elçi is in the morgue,’ a voice replied. The morgue is the place they keep dead bodies. I heard my head hitting the floor. A little later, people helped me stand up and I hurried to the morgue. There was a crowd of people and many voices. I couldn’t understand anything. For three days, I was thinking it was all a dream. Then the light snow started. It was early winter. I began to think that under the ground – where Tahir now was – it was cold. He hated the cold. After my dream state ended, the pain of Tahir’s death made my bones cold. That time was so painful. It is not easy for me to think about it, or describe it. I have to go back to the time I want to forget. But this is not the whole story of my husband’s death. The full story of the killings in our country is a much longer story. The country became a battleground. Death was holy, not the right to life. Killers pulled innocent people into their game. They killed people who are against war. So they made us part of it. Tahir Elçi was talking about the right to life when they killed him. He was one of the few people brave enough to speak about the violence. The fighters did not want to hear him. They had to get rid of what Tahir was saying - ‘that people should not die, that humanity should not be destroyed, that fighting should end’. After he died, there was more violence. In the days after his murder, whole cities were destroyed and many people died and no-one knows their names. In these places with no laws, he stopped the laws disappearing. He tried to investigate the many people who disappeared and bring the people responsible to justice in international courts. He was fighting against impunity (no punishments for important people). So the people who didn’t want justice killed him. Tahir was killed in front of everyone. Cameras filmed it. But the hopes of people who want peace did not die with him. Losing him has made our belief stronger. We believe that if we want to have a better world of hope, we have to end the imaginary boundaries that divide us. We must help the oppressed and help the victims wake up from their winter sleep. NOW READ THE ORIGINAL: https://newint.org/features/web-exclusive/2016/11/28/a-year-on-from-tahir-elcis-murder/ (This article has been simplified so the words, text structure and quotes may have changed). This page was last edited on 2 December 2016, at 21:40.